Sophomore Lydia Quandt running the Red Out sale. 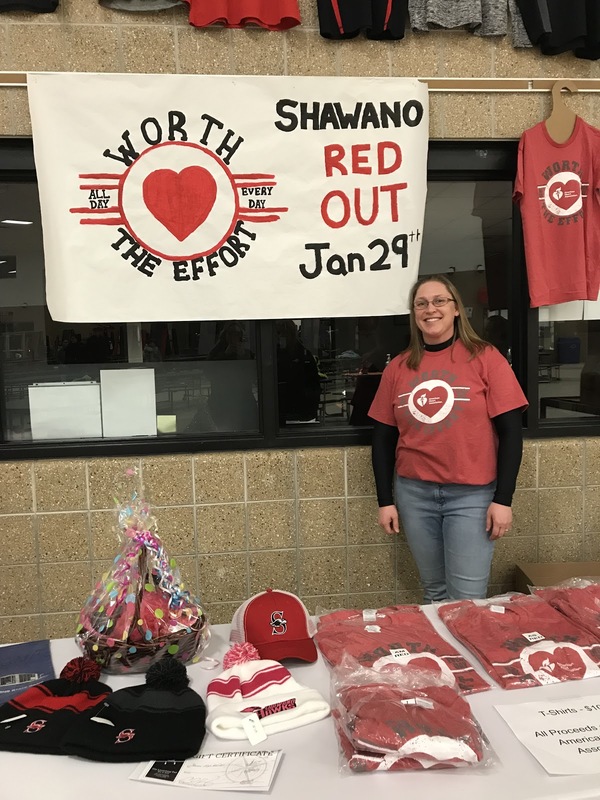 Friday, February 1 Student Council members sold shirts at the girls’ basketball game at Shawano Community High School in support of the American Heart Association. There was a fundraiser that contained a dash for cash and a thank you to first responders to kick off the game. Mrs. Kris Johnson was the supervisor for the event and kept it running smoothly. “We had several meetings with members of Student Council, FFA and NHS [National Honors Society] to decide who was doing what. We had students going to businesses asking for donations, students making signs and posters and students finding volunteers to sell T-shirts,” stated Mrs. Johnson. This was the ninth year doing the Red Out, and the outcome was very different. With the change in date and days off school due to inclement weather, they were hoping to raise at least 500 dollars, and in previous years they raised close to 1,000 dollars. The raffle consisted of a 25 dollar gift certificate from the Launching Pad, a gift basket from Body Essentials and Hawk baseball and stocking caps from Bolin’s Speedy T’s. Mrs. Johnson running the Red Out sale. The American Heart Association researches to help find ways to reduce the chances of getting heart disease. That is why it is essential for people to donate and maintain a healthy lifestyle of their own. Some ways people can help the association is by merely helping themselves. According to Mrs. Johnson, exercising 60 minutes a day for children and teens and 30 minutes a day for adults can help lower the risk of heart disease and most other diseases. Not only that, but everyone is encouraged to eat five to ten servings of fruits and veggies a day in a variety of colors and keep their weight within a healthy range. “With heart disease being the number one cause of death, heart attacks and strokes are widespread. First responders are typically the first ones on the scene to help in an emergency. It is because of them many people have a second chance at life,” stated Mrs. Johnson. 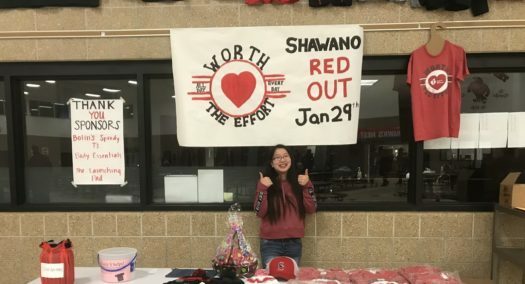 The Red Out team prepared for this event months in advance so that it went without a hitch, and the Art Club made posters for it. The businesses were thanked for the donated baskets and items that were added to the raffle. The first responders were also thanked for coming to the game to show their support for the community. “It is important to spread awareness of our hearts and to promote the American Heart Association. 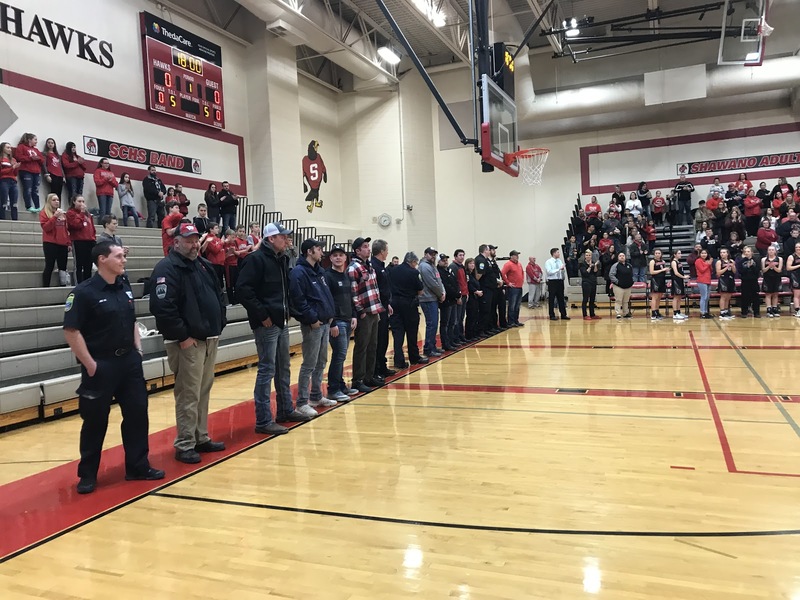 I think the first responders’ tribute was a very nice addition to let everyone see the people on call every day ready to come to our rescue,” said Quandt. The first responders being thanked.